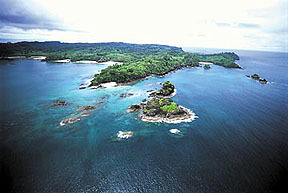 A true ecological experience on the second largest privately owned island in Central America. 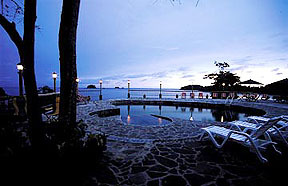 Located on a privately owned 14,000 acre tropical island in The Pearl Islands of The Republic of Panama. These are the same islands where the CBS "Survivor - Pearl Islands" series was filmed. 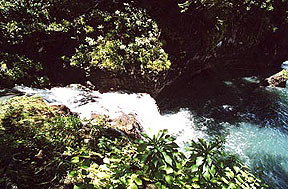 The Survivor show featured this resort as a "Reward" and in the “Survivor – All Star” series the waterfalls were used for diving into the crystal clear ocean. 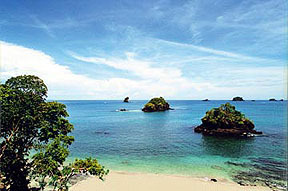 It's a 44 square kilometer island of volcanic origin with exuberant pristine rainforest and over 30 sandy white beaches. Indulge yourself with resort comfort, hospitality and fine cuisine and at the same time enjoy the natural wonders and scenery provided by mother nature in this Garden of Eden. This property's unique and spacious accommodations blend island charm and modern comfort, all just steps from the beach. 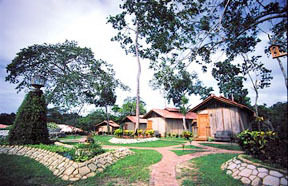 Each of the seventeen cabañas are constructed with finest Panamanian "caña blanca" and pine wood. Large screened windows with wooden louvers give guests full access to the breathtaking ocean views and gentle floral scented breezes. 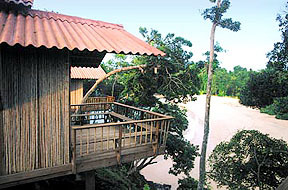 This Eco resort offers three types of beachfront cabanas, namely, Standard suites, Junior suites, and VIP cabanas. 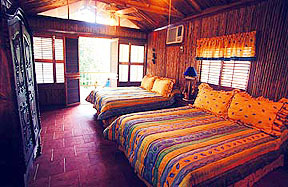 10 Standard Suites: Beachfront Single room Bungalows with two double beds, private bathroom, and balcony. 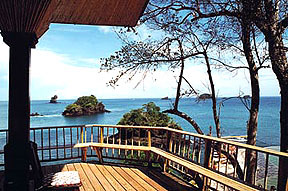 2 Executive Suites: Beachfront Single room Bungalows with a King size bed, a sofa bed, private bathroom, and balcony. Also includes a mini bar, coffee maker, and small refrigerator. 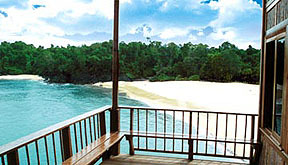 4 VIP Suites: Beachfront Two room Bungalows including a private bedroom and living room. Amenities include a King size bed, a sofa bed, bathroom, and larger balcony with spectacular views. Also includes a coffee table and chairs, mini bar, coffee maker, and small refrigerator. 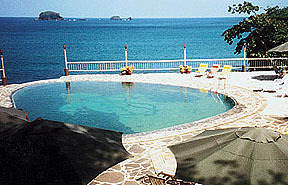 1 Deluxe VIP Suites: Beachfront Three room Bungalow including 2 private bedrooms and living room. Amenities include a King size bed, 2 twin size beds, a bathroom, and larger balcony with spectacular views. Also includes a coffee table and chairs, mini bar, coffee maker, and small refrigerator. 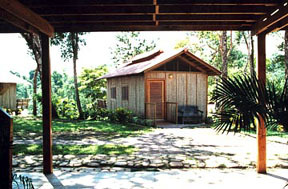 The property offers an array of amenities in each cabaña to make each guest's stay as carefree as possible. There are either full or king sized beds, optional air conditioning, powered lights and ceiling fans, large private bathrooms with hot showers and the freshest water. A mini refrigerator stocked with refreshments, coffee and tea making facilities are available only in the VIP cabañas. There is also a Clubhouse, which is built 75 feet above the Pacific Ocean upon a majestic point with picturesque ocean and beach views at every turn. It features a full restaurant, serving delicious breakfasts, lunches, and dinners - featuring tropical fruits and the freshest of seafood. In fact, fish, crab, and lobster are caught just off the island daily. 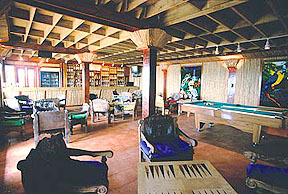 The Clubhouse also offers several screened sitting rooms, a sunny dining room which overlooks the "Three Monks", a small library, a bar with a cozy lounge with a pool table for drinks and sunset gatherings, a swimming pool overlooking the Pacific ocean, a snack bar, a sauna and a gym. Humpback whales can often be seen right from the pool - It's awesome. The owners also raise sea turtles, for future release (approximately 2000 are released every year) in salt water pools right next to the pool for your ease of viewing - a guest favorite. 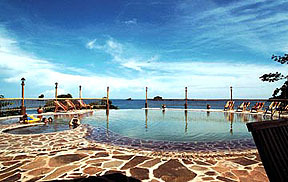 Activities on the island include: Swimming and sunbathing. Fishing. Snorkeling. Kayaking. Hiking and trecking. Jet skiing. Water Skiing. Mountain Biking. Sight seeing in your own golf cart. 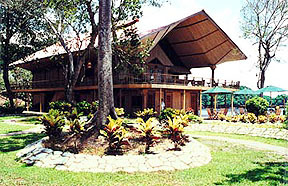 The Clubhouse offers the following facilities: Natural Spring Fed Swimming pool. Sauna. Sports bar equipped with 3 TVs with Direct TV. Snack Bar. Gym. Pool table. Table games. There is TV and Video VCR rental available for your private cabana as well. The following tours of the property are also available: ATV 4 Wheel drive vehicle tours twice a day through 60 miles of all weather roads and trails. Canoe tours on the rivers and marshes. 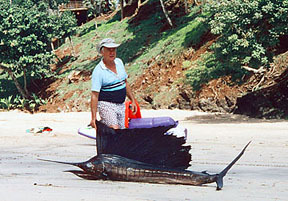 Wild life safari tours (day and night). Scuba diving tours. 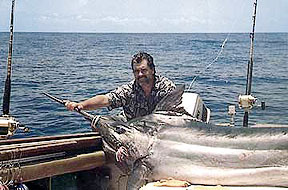 Deep sea and shore fishing tours twice a day. Jet ski tours. Banana Boat Rides. There are 50 miles of road and 57 private white sandy beaches on this Island Paradise. 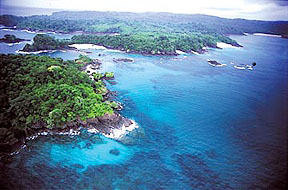 Location - Flights to Panama City, on to domestic airline carrrier to the island in the Pearl Islands. 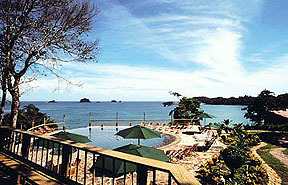 Airport transfers from Panama City arranged through us. 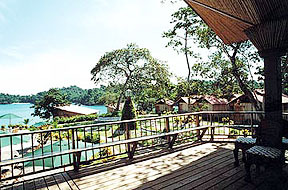 No matter how many of you, this resort is your getway from the rest of the world. 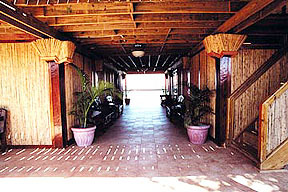 Meals are offered only through the Restaurant. Sample menus available upon request. All activities are at an additional cost, prices provided on request.